Herland Forest invites our Guardians and those who love them, to gather together in the Windward community’s campground (adjacent to Herland Forest) for a weekend of remembrance and celebration. In recent years, Memorial Day weekend has become little more than a tail-gating party that kicks off the summer. We’re asking for your help in our effort to reclaim the holiday as a time to celebrate those who are no longer with us, and to offer mutual support to those they’ve left behind. Our vision is for us to gather together around a campfire in the evening and tell stories of who they were, who they were to us, and why the world is a better place for their having graced it for a while. During the day, folks can spend contemplative time in Herland Forest, near their loved one’s resting place, or near the place they’ve chosen to rest themselves some day. Or they can explore the local attractions. For example, if they’re really ambitious, they can take on the Olympic ski runs on Mt. Hood, windsurf the Columbia river, or do a day climb to the top of Mt. Adams. If they’re looking for something more laid back, they can tube the Klickitat river, explore lava tubes or hike the Rails-to-Trails path that leads down from the plateau through isolated canyons to the river. Or they can visit a full-scale model of Stone Henge, a castle built for a Romanian princess or do wine tastings at the vineyards that line the Columbia River. What we’re envisioning is a free-form, pot-luck sort of Gathering where people can step away from the organized world and focus on reconnecting with nature and with each other. And in an age when many families are separated by long distances and lack a family homestead to gather at, we hope that this event will evolve into an extended family gathering that reaffirms family ties. The target dates for the Herland Forest Memorial Gathering are May 24-27, 2019, but our plan is to have the campground open for the Guardians and friends of the Herland Forest from Sunday, May 19th through Sunday, June 2nd so that those who come from long distances can block out the time, either before the Gathering or after, in whatever way best suits their family’s schedule. We see this as a homecoming event for those who have helped create Herland Forest, and for those who are helping it fulfill its potential. Our desire is to bring together the visionaries who are helping to protect this forest from commercial development, and honor them. Accordingly, there won’t be a preset charge for friends of the forest to attend the event, but we will ask for donations to help cover costs, and to help fund the tools and resources needed to steward the cemetery. We ask that those who are considering attending the Gathering let us know in advance by sending an email to herlandforest@gmail.com . This is especially true for campers who have RVs or special needs. There are a number of things we can do to make accommodations, but ultimately Herland Forest is a forest. Windward’s campground has a variety of camping sites and options to choose from, enough to enable a handful of family groups to camp together. If you’re thinking of bringing an extended family group, that’s something which would be important to discuss ahead of time. 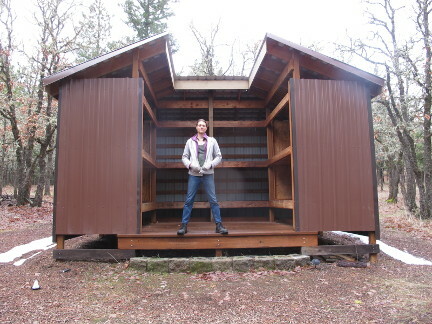 We also have an Adirondak, an 8 bunk camping structure that’s available by reservation. The campground has hot water showers, potable water, designated fire pits and vault toilets. Campers should plan on bringing and preparing their own food. The campground does have propane stoves, as well as a refrigerator that campers can use. For those flying in to the Gathering, camping gear can be shipped to the site by UPS, and we’ll hold it for your arrival. With the goal of helping us all step outside of the passions of the day, we ask that the event, like Herland Forest itself, be considered to be a “politics free” zone.